Summary: A walk in the wide and wild moorlands centred between Skipton to the west and Harrogate to the east. 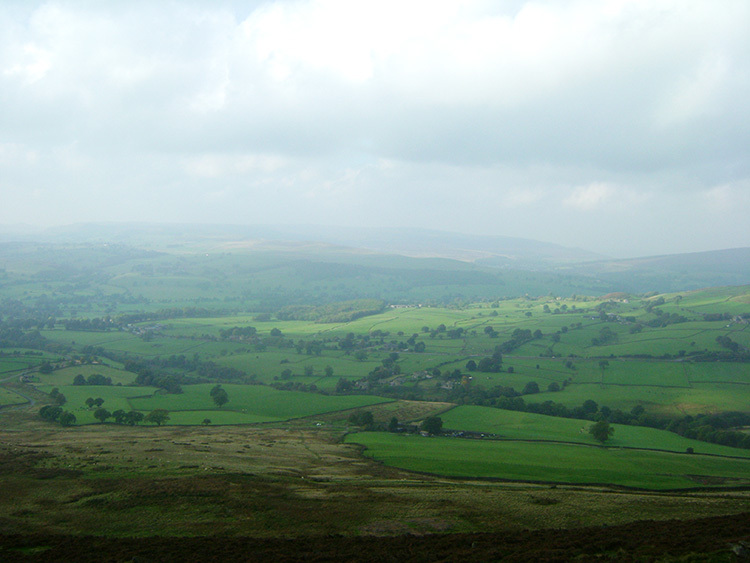 The moors of Beamsley, Langbar, Middleton, Denton, Askwith and Blubberhouses which form the range are criss-crossed by paths, some new and most ancient. The moors may appear quiet and remote from life in the valleys below but a wide range of upland wildlife frequent the upland including migrating Geese in the winter and throughout the breeding season in springtime. Managed Grouse are seen all year round. As are Buzzards and Red Kites seen scouring the skies above the moors for carrion. And all year round you will find plenty of insect life up here. It can be quite busy on these moors. 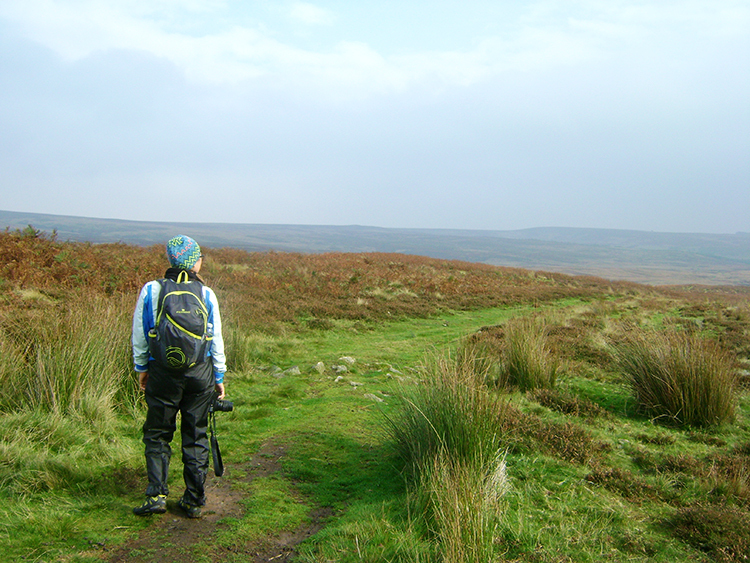 The Walk: I had been joined on the walked by Liisi Toom from Norway who was on holiday in the UK and had contacted me to see if it was possible to enjoy the experience of a moorland walk with me as part of her trip. I was happy to oblige and after making arrangements to meet, which included staying with my wife and I for an evening after the walk I chose a walk local to Harrogate on the moors to the west which rose out of Wharfedale. 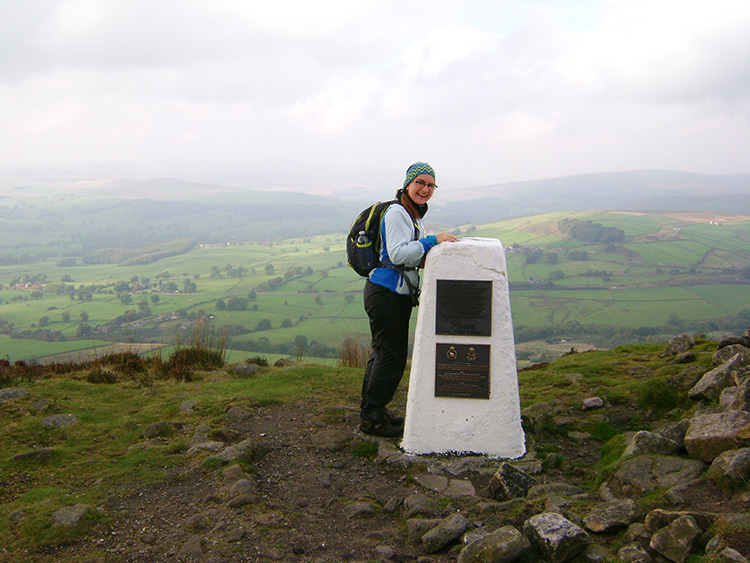 My first choice of route was one which included walking from Bolton Abbey to Simon's Seat but we were sent back early after setting off on that one by the closure of Barden Fell due to Grouse shooting. Hastily I drew up this following the setback. Fortunately I had originally parked near to Posforth Bridge on the Storiths to Appletreewick road so Liisi and I had not walked far on our aborted walk. We were soon back at the car and ten minutes later I had parked up on the crest of Black Hill on Lanshaw Bank. 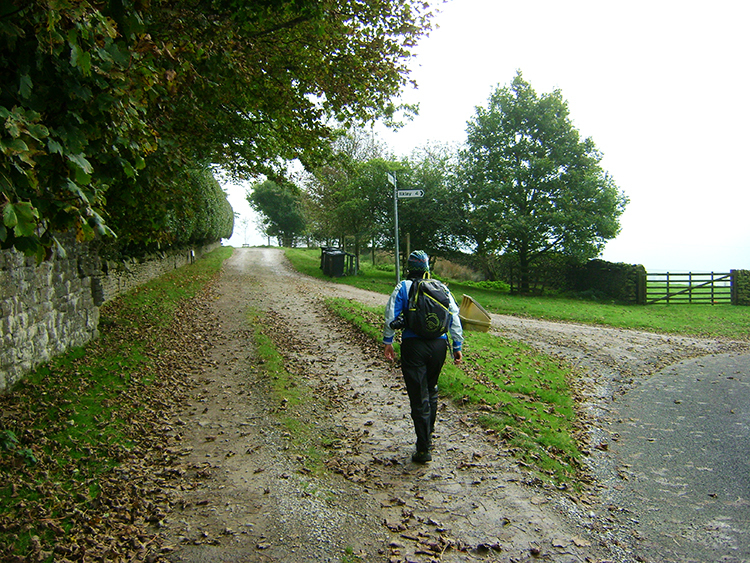 We set off walking, heading south-east from the metalled road and along the unmade lane towards Beacon Hill House. It was a brooding mid October day with low cloud shrouding the high ground. Indeed, the cloud appeared to be touching the moor as we walked from Beacons Hill House across the open ground of Badgers Gate. "Perfect, just as Emily Bronte described the moors in Wuthering Heights" I said. "and just like it often is in Norway too" said Liisi, before adding "I am used to it". We continued on across Badgers Gate, often side stepping from the path to avoid pools of water. We walked towards an unusual sight on the moor and one we were not entirely happy with. Ahead of us on the part was a chap, not walking but on the path doing press-ups. As we neared he jumped to his feet and did star jumps. We passed by the exhibitionist without speaking. Liisi looked astonished. "Luckily not a common practice" I uttered. Then as we crossed from Badgers Gate on to Langbar Moor we came across another walker and again we did not greet the man who, while aware of us, kept his head down as we passed him by while engrossed in a phone conversation. I reassured Liisi by saying "I usually stop and talk with walkers. The two we have just seen are not typical". A little further on from the second of the non-events we reached a brick built shelter topped with grass. "What is this for" asked Liisi. She was not impressed with my answer, feeling sorry for the birds that suffer under the barrage from the guns. My reassurance of "they are fed well though" made no difference to her. We walked from west to east across Langbar Moor and Middleton Moor, sometimes on the south extreme of the one and sometimes on the north extreme of the other. At times during the delightful moorland crossing we were kissed by milky beams of sunshine as it penetrated through the thick patchwork of cloud. When it got through and warmed our faces it was a nice reminder of summer just gone. The bursts of sunshine never lasted too long but the sun kept on trying. 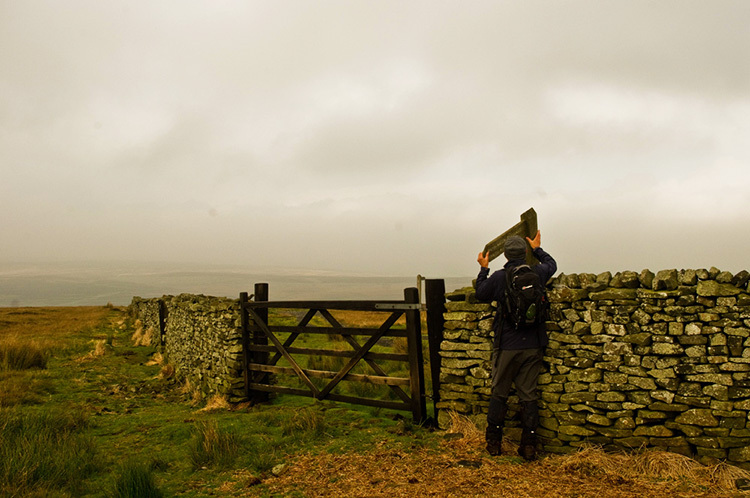 As we walked across Foldshaw Ridge and north of March Ghyll Reservoir Liisi pointed out a bird soaring effortlessly over Middleton Moor Enclosure to our north-east. "What is that bird" she asked. "A Red Kite which is such a beautiful bird" I replied. I told her of when, about ten years ago, they were introduced to this area of England. "We would never have seen them before then. Now they are are common sight in our skies. A wonderful success story of reintroduction". As if to make the point a second Red Kite came into view, this time beyond the reservoir to the south of us. 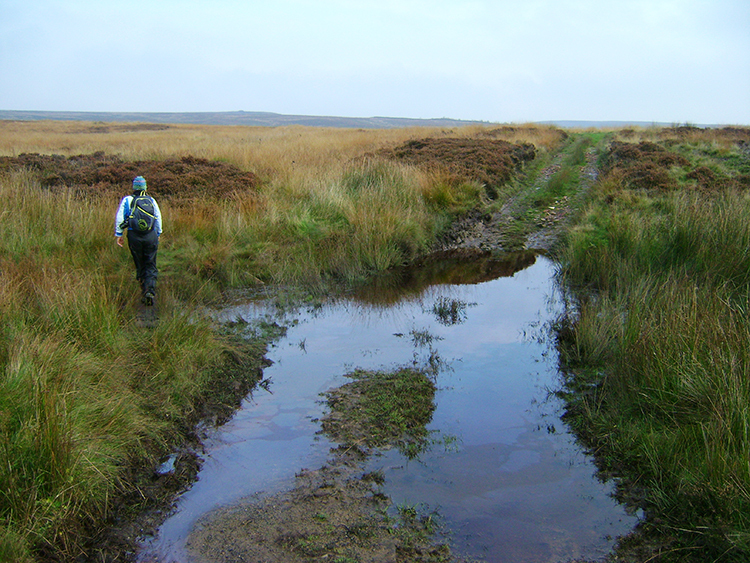 It had been quite a task following the pathway across the moor, every depression being filled with water. Quite a bit of rain had fallen in recent days and much of it was still sat on the moor. The worse of it was on our south side walk from west to east. 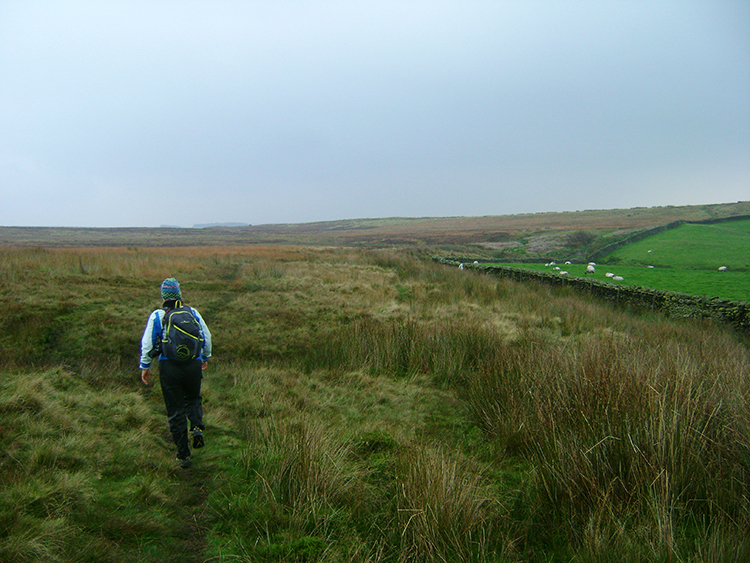 Fortunately when we turned from eastwards to northwards at Bow Shaw the path got much better to follow. The change of direction meant we were also climbing from the lowest point of our entire walk and even walking across Clifford's Bog was easier that before. Clifford's Beat came next and we continued to climb from there on an unerring line to reach Gawk Hall Gate. We had climbed 100 metres on that north north east line. We stopped for a breather at Gawk Hall Gate. 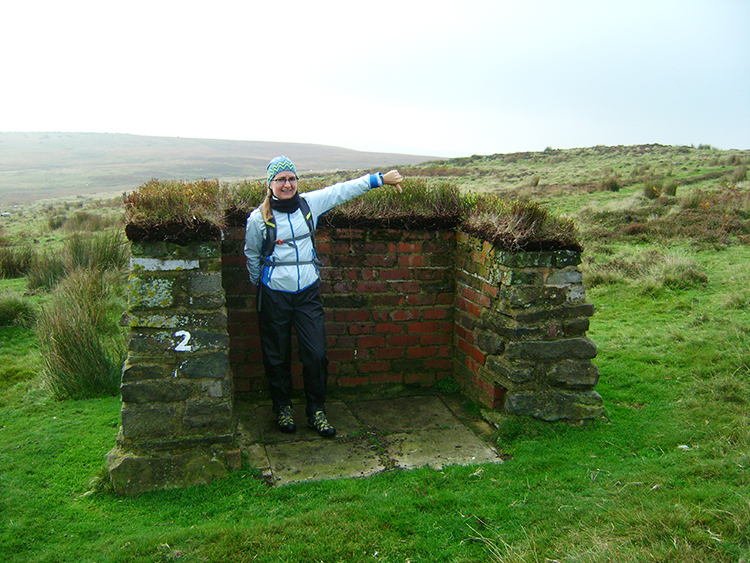 I told Liisi this was a familiar place to me, having been at the gate on quite a few previous walks on the moor. 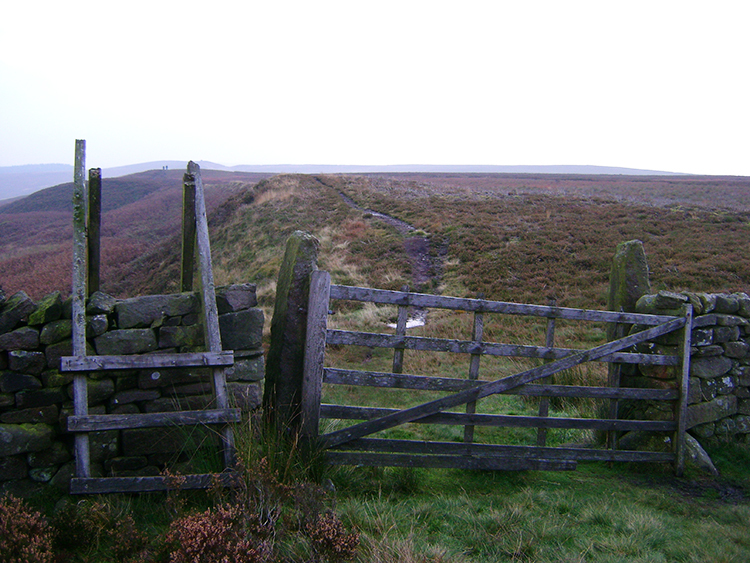 I pointed the various ways east to Blubberhouses Moor, Great Timble Wood, Denton Moor and to Askwith Moor. All stomping grounds of mine. Then I pointed the way westwards to Round Hill. "We are going that way". There were only Liisi and I on the moor as we walked from Gawk Hall Gate to Round Hill. The only noise, apart from the tread of our feet, was that of the wind as it whistled when rippling over the tips of the upland Heather. 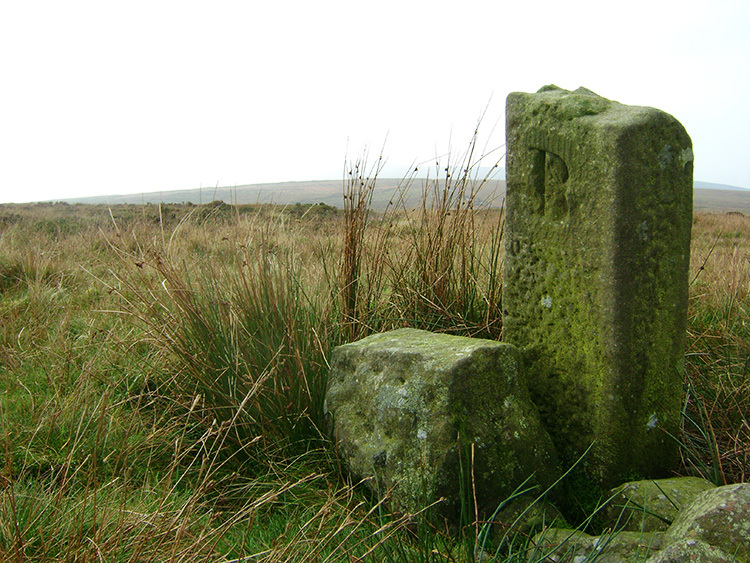 I assumed it had not always been a lonely moor though; a milepost standing beside our part indicated an ancient right of way. 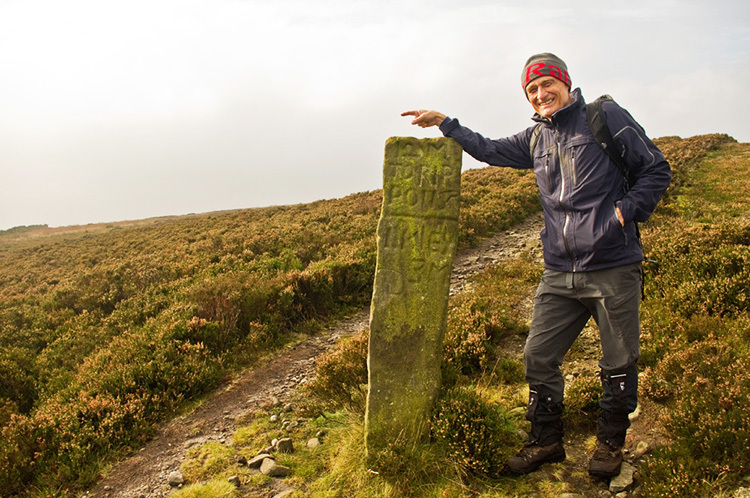 Not on our course from east to west though, the ancient way showed the old road going from north to south, from Ripon to Ilkley, two of the oldest towns in Yorkshire. 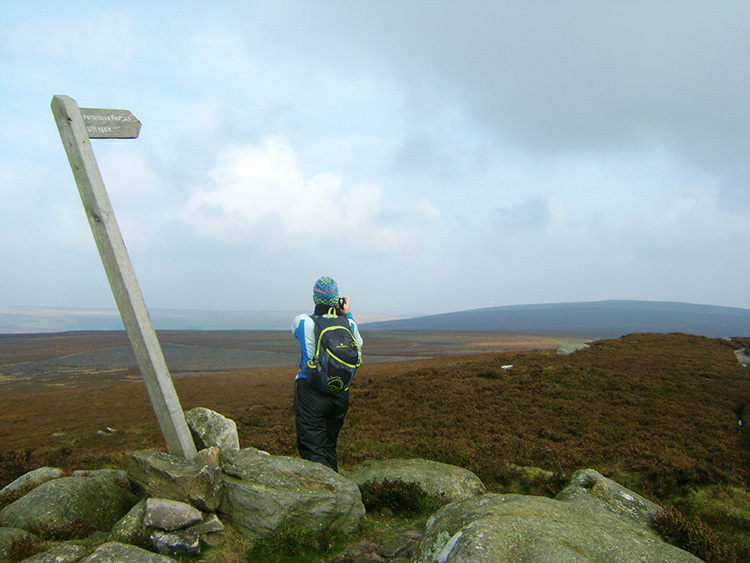 The milepost showed Ripon was 12 miles north and Ilkley 3 miles south. Both Ripon and Ilkley were important staging posts in medieval times and the milepost will have been a welcome reassurance to many making the journey in the days of yore. The milepost, almost steadfastly erect fared better than a wooden signpost on the new way we were walking. Near a gate and wall on the approach to Round Hill the wooden signpost pointing the way to Beamsley Beacon had fallen over. I propped it back up against the wall, the best I could do until men with digging tools could fix it back in the earth. Liisi and I reached Round Hill and then we set our sights on Beamsley Beacon which we would attain by altering our east to west line. From Gawk Hall Gate to Round Hill we had walked north-west. From Round Hill to Beamsley Beacon and from Beamsley Beacon to our finishing point we would now maintain a line south-west. 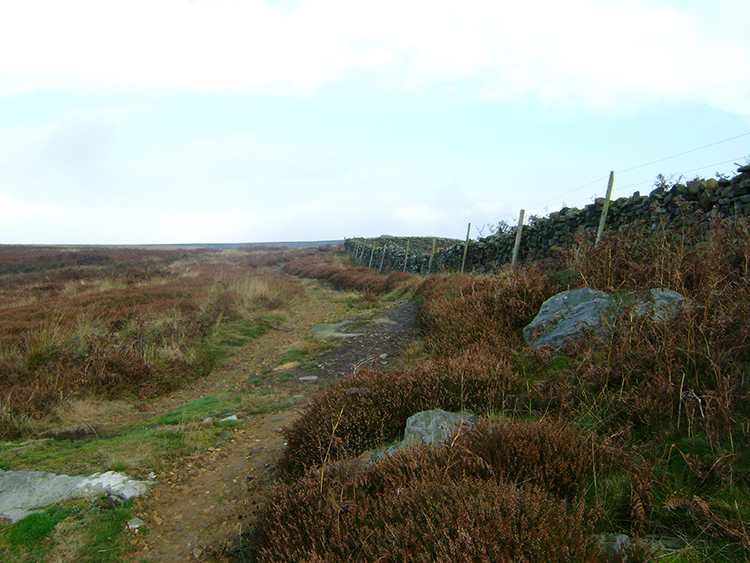 And the line we followed from Round Hill to Beamsley Beacon was also the direct line which separated Beamsley Moor from Langbar Moor. A series of regularly spaced boundary posts told us this. Much younger than the milepost on the route between Ripon and Ilkley these were not marked with place names but with simple lettering. 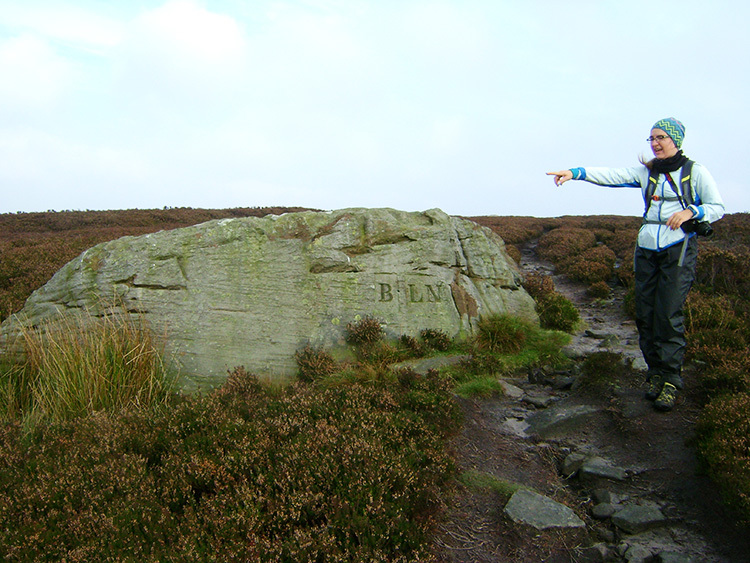 There was an L impressed into the stone facing Langbar Moor and a B impressed into the stone facing Beamsley Moor. Sometimes boundary stones were not used. 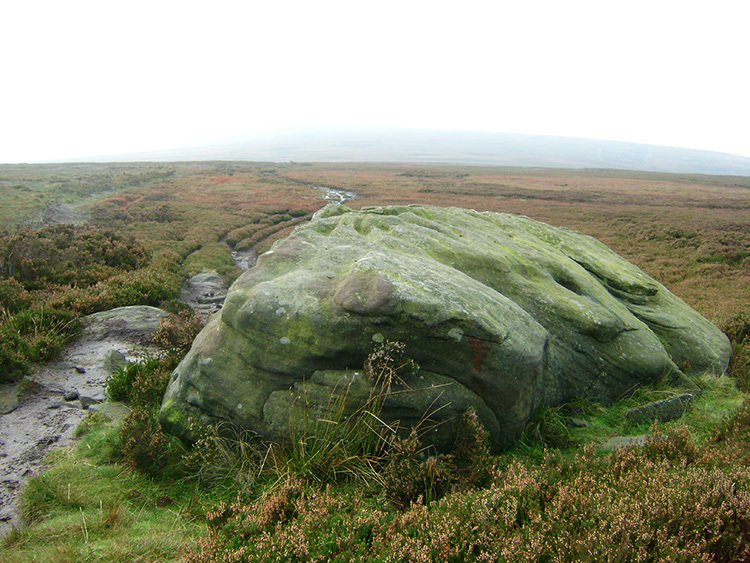 Where natural gritstones were found were found beside the path they were stamped instead. As we drew ourselves up across the moor to the highest point of our walk at Beamsley Beacon the weather played its part by letting the sun out from behind the cloud once again. It had been hidden on the walk to Gawk Hall Gate and Round Hill. The effort the weather made was appreciated and it rewarded us with the best views of the day, and just at the time we needed them. I really had wanted to show Liisi the view across the sweep of Wharfedale from Beamsley Beacon which I maintain is the best viewpoint of the whole Wharfedale valley altogether and it was looking like she would get to see it. First though we walked in the improved conditions to the subsidiary outcrop at The Old Pike, just 400 metres from the true summit and just eight metres lower in altitude. Another wooden signpost was bent from true standing here but still doing its job. It pointed to Round Hill but indicated Littlegate. Checking the map I discovered Little Gate is at the summit of Round Hill. I had learned something new. After enjoying the moment on The Old Pike we walked the 400 metre long, eight metre ascent to Beamsley Beacon, alternatively known as Howber Hill. I showed Liisi my favourite view of Wharfedale which to my relief, had revealed itself with the struggling October sun helping as best it could. 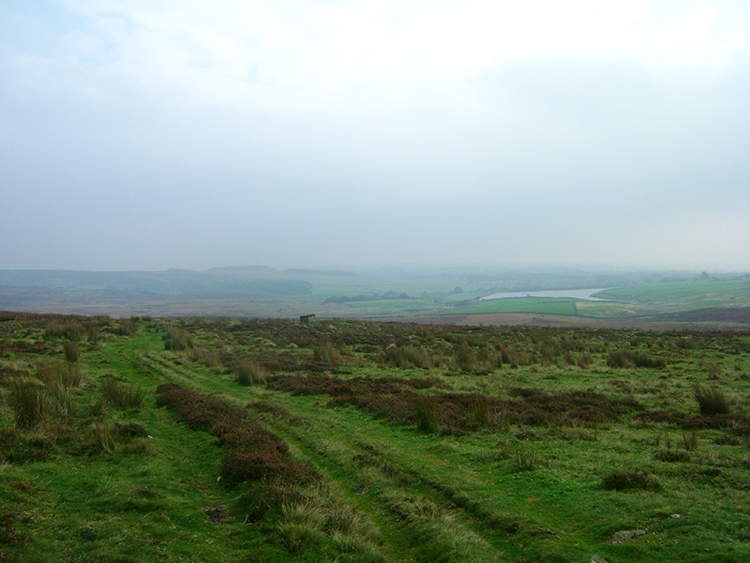 I pointed out the course of the river as it emerged from the Yorkshire Dales in the gap between Embsay Moors and Barden Moor at Barden Tower and showed the line it followed south through the Strid to the Bolton Abbey Estate and Bolton Bridge below us due west before sweeping past the village of Addingham to Ilkley, while turning from southbound to east bound. On enjoying the view and after sitting taking it the moment for a short while Liisi and I concluded out walk by dropping down on the good path from Beamsley Beacon to where I had left the car at Lanshaw Bank. Quite a few people were climbing the path as we descended. My favourite Wharfedale view is popular and enjoyed by lots besides me. "So, have you enjoyed the walk" I asked. Liisi answered "Of course, it was so lovely. Thank you for taking me".